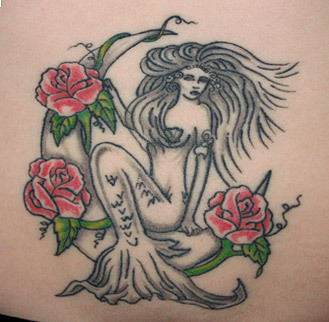 The mermaid tattoo is a staple of the tattooer's art along with anchors, skulls and "mother". It can have elements of sensuous beauty or be a girly pin-up. It can also be part of an nautical-theme tattoo. H.R. Giger artist and art style made famous by the "Alien" movie, combines mechanical and organic shapes. ... remember, one-third of all people who get tattoos regret having them. They are permanent. In a conspicuous place they can also be embarrassing. Some of the questions you should ask yourself are: will I still want this tattoo five, ten or 20 years from now? It is a good idea to "test drive" the tattoo experience with a temporary tattoo. Tattoo removal is possible. There are two basic methods: laser and surgical. The laser method is expensive, time-consuming and painful. The surgical is expensive, time-consuming, painful and leaves an ugly scar. Also, no medical plan will pay for tattoo removal. If this causes you to think twice about getting a tattoo you are in the right frame of mind. After all is said and done, if you find you still want a tattoo it is important to chose one you will love. Remember, you will have it for a very long time. You should research what type of tattoo you want and look at as many designs as possible. Ever since I was a child I have loved mermaids. Disney's "The Little Mermaid" was the first movie I ever watched, the stepping stone for my passion with the beautiful fish-tailed creatures. When my tattoo-loving father asked me when I was 12 if I would ever get a tattoo I knew exactly what it would be of, but what would she be doing? Like you read in this website a tattoo is very serious. Its placement and design are permanent! I spent 6 years thinking about what I wanted, and when my grandmother passed away in October 2005 I knew what it would be. A mermaid sitting on a moon, covered in roses. The mermaid represented my love, the moon represented the sky where my grandmother now lives, and the roses, they are my grandmother. Roses where her most treasured of things. Mermaids are a figment of our love for the mystical, and for me my tattoo is a permanent reminder of the ones I hold dear to my heart. Keri has a great mermaid tattoo, don't you think? A really good source of advice and information about tattoos is the Bodyart/Tattoo FAQ at faqs.org.